The world’s biggest funds management firm, BlackRock, last week bought rising San Francisco-based auto-advice business, FutureAdvisor for a reported US$150 million plus. In a statement, BlackRock said it would offer the FutureAdvisor technology to other financial institutions rather than target individual investors directly. “The acquisition of FutureAdvisor helps meet the needs of a range of financial institutions including banks, insurers, large and small broker-dealers, 401(k) platforms, and other advisory firms looking for a digital-advice platform to increase customer loyalty and grow advisory assets,” the statement says. FutureAdvisor, which boasts about US$600 in assets under management, back-ends client portfolios into a range of exchange-traded funds (ETFs). BlackRock subsidiary, iShares, is the world’s largest ETF provider. Most robo-advice players such as Wealthfront, Betterment and Charles Schwab, predominantly build model portfolios around ETFs. Passive investment giant Vanguard also officially launched its robo-human hybrid ‘Personal Advisor Services’ earlier this year after the pilot version garnered more than US$4 billion in ETF assets. In a Reuters report, Frank Porcelli, head of BlackRock US wealth advisory unit, said FutureAdvisor would appeal to the ‘mass affluent’ – or those with less than $1 million to invest – and ‘millenial’ clients. 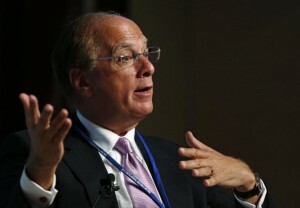 Younger investors would increasingly seek online advice, Porcelli told Reuters. Reuters also cited comments from BlackRock CEO Larry Fink this May, picking that most financial institutions would need a robo-advice solution. FutureAdvisor would be housed under the BlackRock Solutions unit once the deal is completed later this year. Last week, the NSW government-backed Stone & Chalk also opened a financial technology “innovation hub” in Sydney, kicking off with 41 start-up firms. “Stone & Chalk’s initial startup line-up spans a wide ranges of industries, from superannuation to predictive data analytics; as well as technologies, from consumer apps to crypto currencies,” the launch release says.